Can you bring your kids to the convention? It seems to be a question that comes up every time that Salt Lake Comic Con has an event, whether it be Fan X or the actual Comic Con. People who haven’t been before, or people who have never brought their kids before, they all wonder if this event is appropriate for them to bring their little ones. The short and easy answer is yes. The folks at Comic Con seem to realize that we are a pretty family friendly market, and so they try to make their convention as family friendly as possible. It’s really a tough task, when you think about it. On one hand they have to provide enough entertainment and things for adults, while at the same time providing some great things for the kiddos. They seem to improve their balance here with each convention. If you have never been to the convention with your kids, have no fear, your friendly neighborhood Geeky Mormon is here to help. I have five little ones of my own, which means we are a traveling circus wherever we go. I have also brought them to every convention for at least one day since the first Fan X. That means I know of which I speak, when I speak about bringing kids. We have made our fair share of mistakes along the way, but hopefully you can learn from those mistakes and end up having a smooth and wonderful time at the upcoming Salt Lake Comic Con. Here are 10 tips my wife and I have learned along the way. Hopefully you will find some of them helpful. I cannot emphasize enough how important this tip is. Kids get hungry a lot quicker than adults. They are constantly going and using energy and constantly need that energy refilled. At Salt Lake Comic Con, the food is typical of most conventions or major events. It is expensive and typically not healthy. You’re not going to find an organic fruit stand in the middle of the vendor floor. It is up to you to bring the snacks you want your kids to eat and provide them. You will save a ton of money this way, and ensure your kids are eating what you want them to eat, whether that’s organic fruit, or granola bars, or crackers or whatever. At this point, I should point out that the official rule at the Salt Palace is no outside food or drinks. I personally have had no issue with bringing in our own snacks for the kids. I think for the most part, anyone checking bags takes a look at my wife and I loaded down with our 5 little monsters, and they take pity on us. Truth is, I have heard the same from quite a few people with kids- no issues with bringing in food. Water bottles are a must, as well. It is easy to get dehydrated, so bring plenty of fluids, or at least bottles to hold water. They have drinking fountains throughout the convention center to refill the bottles. Much less expensive than buying a water bottle. Each year, Salt Lake Comic Con gets bigger than the year before. The stars and names seem to get bigger, drawing a larger crowd. This year should no different with the likes of Chris Evans and Sebastian Stan and Jenna Coleman appearing at the con. The crowds are going to be huge. Saturday will probably be a record-setting day. There may even be times where they have to stop letting people in. It has happened before. You need to be aware of this and plan for it. Thursdays are typically the day we bring our kids, because they are the least crowded. The important thing to note in that sentence is I said “least crowded.” This is important because “least crowded” is not the same as not crowded. Each day is crowded, so you need to be prepared. For example, we don’t bring our giant double stroller. We bring our umbrella stroller and kid leashes (They’re Mickey Mouse, so we call them “Mickey Hugs.” The kids love them). This makes it easier for us to navigate the vendor floor and there hallways. Whatever considerations you might need to make, make them. It will be crowded. You have been warned. There will be plenty for you to spend your money on in the vendor area. Plenty to attract your children too. Be prepared for it. We normally set a budget for the 3 days and bring it in cash so we can monitor how much we have and how much we have spent. If your budget is high, and you don’t feel comfortable carrying cash around, then don’t, but it works for us. The budget is the important part. Your kids will see plenty that they want to buy, whether it’s a cool toy or a picture or food or even face painting. Having a set budget makes it easier to limit what you buy and prevents you from breaking the bank on this one event. My kids expect some kind of print from every show. I shop Artist Alley to find some great prints, and typically the prices are pretty reasonable. Whatever it is you want to get the kids, having a budget will only benefit you. Kids cannot go at the same pace for the same amount of time as adults can. They will get worn out. Plan in some times in your schedule to sit down and have a break with the kids. There are typically places you can find to sit down and maybe break out the snacks and water and just sit and eat and enjoy the people watching. Or we have gone into the board game area and picked a family friendly game to try out and sat and played for a few minutes. Just find some quiet place to sit and take a breather. You will thank yourself later. Did you know that most kids don’t like waiting in lines? It’s true. You want to know how I know that? It’s because most adults hate waiting in lines. We do it and suffer through because we know that the payoff at the end is worth it. Kids don’t always make that connection, depending on their ages. We try to avoid waiting in a lot of lines with kids. If you are waiting for an autograph, and you have traveled to the con with at least one other adult, maybe have one adult wait and get the autograph, while the other finds another, more kid friendly activity. Find ways to have one person wait, while the other entertains the kids. 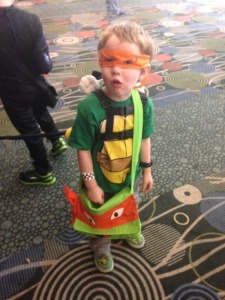 Comic Con can be a magical place for kids, as they walk down the corridors and pass their favorite heroes. That has to be pretty amazing for them. Take advantage of the opportunity. Most Cosplayers are very friendly and don’t mind stopping for a photo. Make sure to always ask politely first, and try to find a good place to take the picture that is out-of-the-way. I always try to pay them a sincere compliment on their costume and thank them for the picture. The kids will think it’s cool to have their picture with Thor or Spider-Man or whatever. This is a great opportunity. As you plan out your time at the con with kids, make sure you plan in some activities that the kids will really enjoy, and avoid taking them to some that are not geared toward kids. 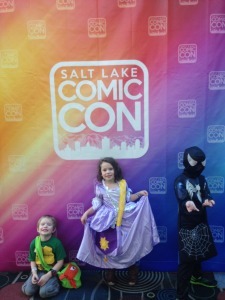 Salt Lake Comic Con makes this easy with their KidCon. This is a section of the con that is geared to the little ones at the show. 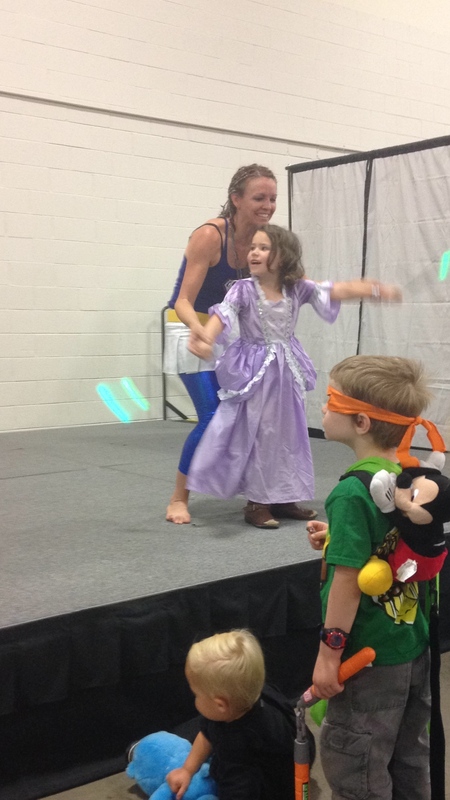 There is always something going on in the KidCon for the kids, so check this area out, and you may come back a few times to keep the kids entertained. This year, it looks like they are putting it in its own room, apart from the actual vendor floor. I am interested to see if this is an improvement, or not. I have a feeling that this makes sense and will be a good move. There are so many great things going on at this year’s Comic Con, that there is now way that you will see it all, anyway. With kids, you will see even less. You need to know that before hand and have those expectations. When I bring my kids on Thursday, I don’t know how much of what I want to see, like a lot of the panels, I will get to see with my kids, so I expect that for Thursday, and plan to see and do more on Friday and Saturday. Don’t go in and expect to see everything you want. Kids will slow you down, it’s just how it works. If you go into it and expect to see everything you would normally see, you will end up frustrated and disappointed. 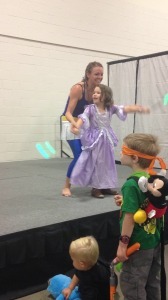 If you manage that expectation, then the kids will have fun, and you will too, and make some great memories. Every kid is different, so you need to know your kids and what they can and can’t do. You need to know whether they can sit through a lot of long panels or if they can’t. You need to know if they can wait in a long line, or if they can’t. You need to know if they can go to the con all 3 days from open to close, or if they can’t. No one on any of the Facebook pages or threads or Twitter or whatever will be able to tell you what your kids limits are. That being said, you need to know those limits and plan accordingly. 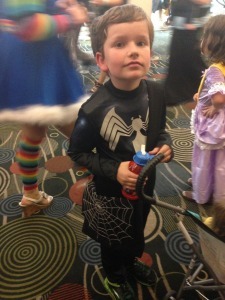 I know my kids won’t sit through most of the panels I want to go to, so I don’t bring them to panels. I also know that going for part of one day is about all my kids can handle, so that’s our limit. 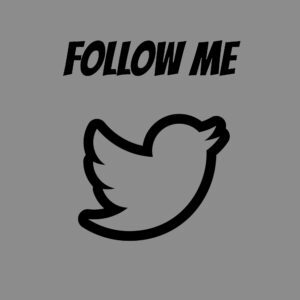 This is the most important thing you can do. 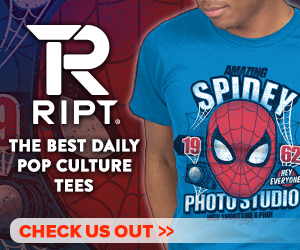 Chances are, you are going to Salt Lake Comic Con because it represents something that is important to you. Chances are, you want your kids to feel the same way. 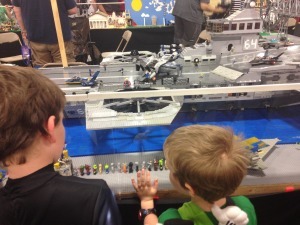 You want them to be the next generation of geeks. Who doesn’t want that? The best way to accomplish that is to get them involved in things like comic con, and to make sure they have a great time doing it. Those are memories that will last a lifetime. That really is the most important thing for your kids. So, just have fun! So, what are your plans for Salt Lake Comic Con? Are you going? Are you bringing kids? Are there any tips you would share that i left off the list? 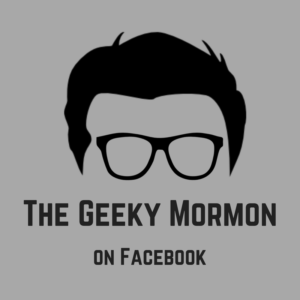 Let me know in the comments or email me directly at thegeekymormon@yahoo.com. We love to hear from you. This entry was posted in Adventures of a Geeky Dad, Conventions and tagged Adventures of a Geeky Dad, Salt Lake Comic Con on September 6, 2015 by Jake Dietz.